Debug information is necessary to display human-readable code location descriptions. It's used by many debugging-related tools to show readable information instead of RAW pointers. There are different formats of debug information. Each tool understands some of these formats. Another tool may understand other formats. If particular tool doesn't understand debug information format of your executable - then it will not show any useful information. For example, Delphi and C++ Builder supports variety of debug formats: embedded dcu/obj, .map (output only), .tds (TD32), .rsm (remote debug), DWARF (currently: 64-bit C++ Builder only) - all of these (except for DWARF) are Borland/CodeGear/Embarcadero-centric. On the other hand, Microsoft tools support Microsoft formats: .dbg and .pdb. Obviously, Embarcadero and Microsoft tools do not understand each other. You can use debug information converters to solve such issues. These converter tools will take some form of debug information as input and convert it into another form. 3. Place a call to converter tool to post-build event. 5. 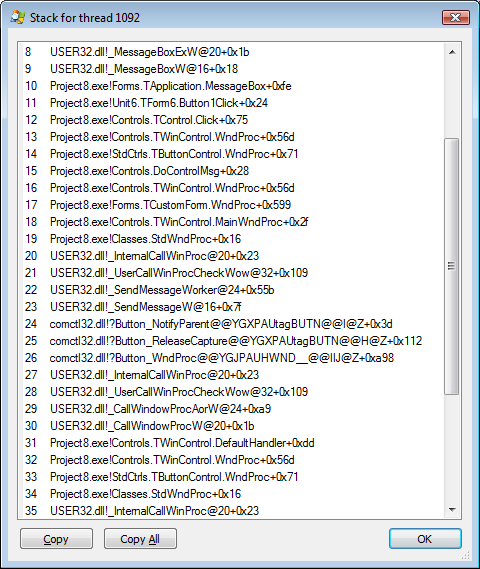 Open build events page and place a call to map2dbg tool to post-build event (success): map2dbg "%_IDETarget%"
• You may need to specify full file path for tool's .exe file (like C:\Tools\map2dbg.exe). • Delphi/C++ Builder 2007+ also have build events. You can use either EurekaLog's or IDE's build events. 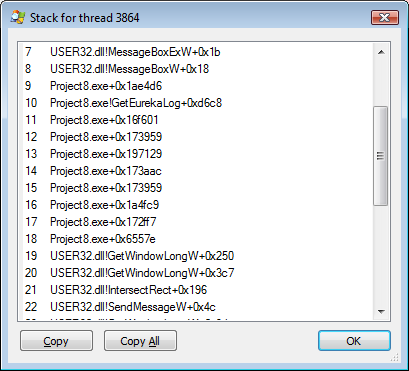 • Debug information converter tool may run before or after EurekaLog's post-processing. If you've done everything correctly - you should see a information about your Delphi/C++ Builder project in Process Explorer tool. 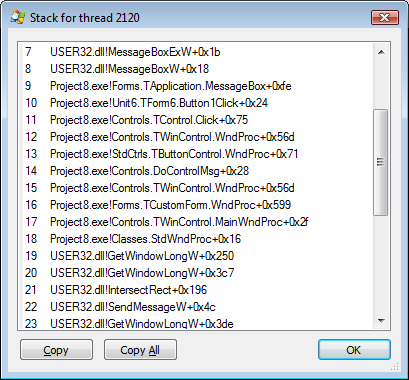 Run your application, launch Process Explorer, right-click on your project in Process Explorer and click on "Properties", switch to "Threads" tab, pick a thread and click on "Call stack" button. You should see readable locations about your code instead of just module name + RAW offset.